Jabong, The Serai, PCJ, PVR & Lifestyle ! Catch the latest launches in the world of Gift Cards, brought to you by Qwikcilver – Everything Gift Cards! The great Indian summer is well and truly upon us. In salubrious Bangalore though we deliberately took the heat up a few more notches. Why you ask us? Well, with the 2nd Edition of the Qwikcilver Gift Card conclave this was bound to happen! The second edition of the Qwikcilver Gift Card Conclave kicked off with greater expectations after a successful and enriching event last year. This year the conclave was held on 18th of April at the JW Marriott hotel in Bangalore. As the only event of this type in Asia, this year also saw some of the best minds come together from across the world to discuss and share insights with the Future Forward road-map. The Conclave also saw the launch of new gift card programs that keep adding to our ever-growing portfolio of brands. All these new launches reaffirm the revolution happening in the Gift Card category in India and how every brand wants a piece of it. Continuing from the previous months, we have some fabulous new offers on Woohoo with great brands. Do reach out to us to explore how we can join hands in making your Gift Cards irresistible for our consumers. As always, we eagerly look forward to your comments and feedback! Pratap, our Co-founder and CMO started off the event and the participants were warmly welcomed Kumar Sudarshan, our Co-founder & CEO. Having set the ball rolling, there was buzz amongst the audience comprising CXOs of leading brands and industry stalwarts eagerly looking forward to some engaging conversations. Apart from the leading Indian brands like the Future Group, Taj Hotels, Landmark Group, Flipkart amongst the others, this year’s conclave also the participation from across the oceans, specifically brands like Woolworths, Valirams, and partners like Blackhawk Network Direct Service and Icolumn. The Panel discussions were wide ranging. The “Rise of the Gifting Planet” focused on the growth of the Gift Card category from both the Indian as well as the Global perspective. “Creating Covfefe Gifting Experiences”, which was the title of the next panel discussion focused on the leveraging technology in gifting as well as straddling disruptions. Keep watching this space, we have more detailed reports on the panel discussions coming up for you. We are proud to announce the unveil of the Semi-closed Loop (SCLP) Gift Card Program for Lifestyle, one of our marquee clients in physical retail. Qwikcilver has been powering their existing Closed Loop program for over 5 years now, and their decision to move the program to SCLP is part of their commitment to provide consumers a seamless omni-channel experience by providing a single card that can work across both offline and online channels. This new program powers an all new Gift Card in three variants – Lifestyle, Max & Homecentre – which can be cross-redeemed across any of the 3 brands at any of the 300+ physical redemption points and their online stores as well. Here is a fashion trend to look out for – the Jabong Gift Card! Thrilled to announce the launch of the Jabong Gift Card program. A leading fashion portal in India, Jabong.com is a young and vibrant company that aims to provide good quality branded products and fulfil the fashion needs of men, women and kids across footwear, apparel, jewellery and accessories. Extremely excited to announce the launch of the Xiaomi Gift Card program – the Mi Gift Card. This e-Gift Card can be used to purchase products ranging from smartphones, accessories, and televisions to smart devices in the Mi product portfolio. Xiaomi was founded in 2010 by serial entrepreneur Lei Jun based on the vision “innovation for everyone”. Today Xiaomi is the largest Smartphone brand in India and the Fourth largest Smartphone maker in the world. We are proud to unveil the PC Jeweller gift card – a truly premium and luxurious gift card offering. PC Jeweller started operations in April 2005 with a vision to redefine elegance, allure and style in the form of stunning pieces of jewellery. Starting with one showroom at Karol Bagh, New Delhi, they are today one of the fastest growing jewellery retail chain with 94 showrooms across 74 cities and 20 states. Building on one of our longest standing relations we are proud to launch the PVR Swipe program. PVR Swipe is a Cash Card program that enables patrons to purchase ticket at box office and buy food & beverages at concessionaire of participating PVR Cinemas. PVR Ltd. is the largest and the most premium film exhibition company in India. Since its inception in 1997, the brand has redefined the cinema industry and the way people watch movies in the country. The company acquired Cinemax in 2012 and had taken over DT Cinemas in the year 2016 serving 75 million patrons annually. Currently PVR operates a cinema circuit of 617 screens at 133 properties in 51 cities (18 states and 1 Union Territory). We are happy to announce the launch of The Serai Gift Card program. Gifting a luxurious one of a kind experience is now just a click away. Explore the picturesque corners of Karnataka with The Serai Resorts Gift Card at their resorts in Chikmagalur, Kabini and Bandipur. The Serai Resorts is inspired by everything around its destination and creates unique experiences based on these inspirations. We had a very insightful presentation by Mr. Daniel Wang, Managing Director – Greater China, Blackhawk Network. Mr. Wang’s presentation spoke about the Gift card market in China and gave the audience some sharp insights into one of the world’s largest markets. Learning from each other is a definite way to grow the category and we had the team from Spar Hypermarkets sharing their experiences with the Spar Gift Card. Finally, the 3rd edition of the Qwikcilver Whitepaper was unveiled by the panellists and Shankar, our President of Core Business here at Qwikcilver. You can download the whitepaper here. In the month of April, Woohoo collaborated with leading brands to bring out some exciting offers as a part of the “Awesome April” campaign. The offers ranged from 5% to 20% discounts on brands like Cleartrip, Faasos, Thomas Cook and Four Fountains Spa. After a wonderful “Awesome April” we have “Magnificent May” happening right now! TTK Prestige, BookMyShow, Spar, VLCC and The Serai are brands looking to attract consumers with their exciting offers! 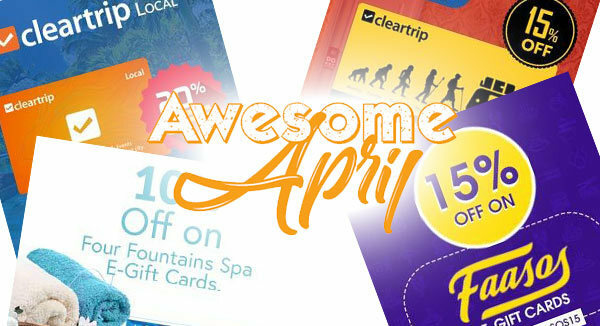 Check out all the “Magnificent May” offers here.